Do you ever find you only make certain dishes seasonally? Potato salad is one of those items for me. It just screams BBQ and warm weather. 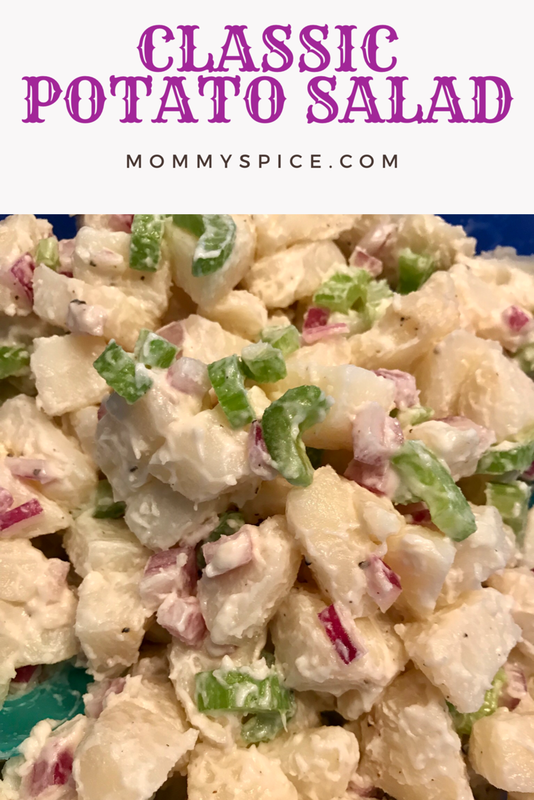 I make potato salad every spring for Easter with my family, my Dad always loves it and says it reminds him of the potato salad my grandmother made. Can’t fight the classics, and that’s exactly what this dish is. Peel and chop your potatoes into bite size chunks about 1” and place into a large pot of salted cold water. Boil your potatoes until fork tender, about 12 minutes or so. Fork tender just means you can easily pierce your fork into the potato pieces. It should be soft enough to chew and eat. Once you potatoes are cooked, drain all of the cooking liquid out and line then on a baking sheet to cool. While your potatoes cool, make your dressing. Whisk together mayonnaise, sugar, vinegar, salt and pepper until smooth. 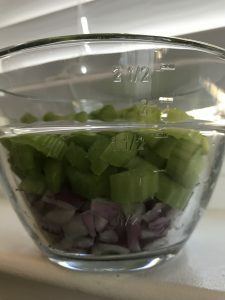 Next dice your celery and onion small and around the same size. Now place your potatoes into a large bowl and pour in your dressing mixture, tossing gently to coat completely. Then add in your veggies and sprinkle with extra salt and pepper to taste, if needed. Cover and place in the fridge for at least a few hours to overnight for the best results. Eat within 72 hours. It might sound strange that I mentioned above, laying your potatoes flat on a baking sheet to cool. I do this so that my potatoes cool evenly, if you place them in a bowl the potatoes on the bottom will keep cooking from the residual heat of the potatoes on top. Also your potatoes will start to brown or gray if exposed to the air for too long, so be sure not to cool them too long. You can also rinse your potatoes in cold water if you desire after boiling and this will help both cool them faster and prevent browning. 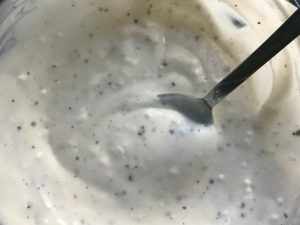 I think the flavor is best in any mayonnaise based salad if you give it a solid 12+ hours in the fridge before eating. 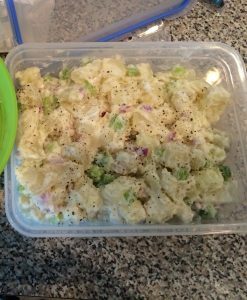 That being said, making your potato salad the night before will actually give you less to do the day of, just take it out and give it a good stir and you’re ready to go.